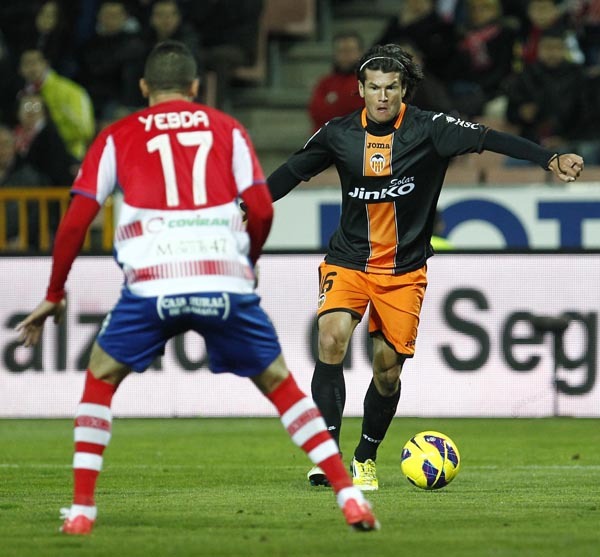 Valencia CF starts the new year with a win, albeit a hard fought and quite conflicting one. It took Valencia CF 82 minutes to win against a 10 man Granada CF, who credit to them hold on well as a defensive unit, but Valencia CF did have the chances to win by more and should have taken them. A victory is a victory as the saying goes, but this match showed that Valencia CF have a lot of improving to do, with improving long range shots of players like Jonas for example, to more useful balls in the penalty area and more combinations in just before the final third so they can open up the opponents. Our wing play was once again exposed, especially on the left wing, since Pablo Piatti was on fire on the right wing, but my point is as I've written a month or two ago that only one wing plays at a time, so we have trouble stretching the opponents and end up attacking only from one side, making it easier on the opposition to close us down. Again it doesn't take a genius, it doesn't take some deep understanding to figure this out and simply seeing the reality of the play shows you that in most matches our wings don't work. In some matches only one wing works, in others none of the wings work and the team also lacks the intricate combinations to do much from the center field. Whether this is a players issue or a tactics issue or a combination of both is hard to say. From my analysis I'd say our wings are too slow and very conservative, the players need to be more adventurous and a lot faster. In most of the matches, all of the players are conservative and worry too much not to loose the ball, instead of trying to dribble past opposition and move in. So I'd say we need faster wings, like we saw in this match with Piatti and more raw penetration, more going in, more dribbling on the wings. There is no doubt in my mind that if Piatti didn't play probably his best match in a Valencia CF shirt last night, that Valencia CF would have won. In fact I think the team would have probably lost, as Piatti was instrumental in both goals, one he provided and the second he scored. So his play created both the goals and he was a thorn all night in Granada's eye. Also I wasn't impressed with how the team played in the first half at all, in fact there was no urgency, no fast plays, the movement of the ball was slow, the combinations were short, the strings of passes were short, the pressure on Granada players almost non existent and the penetration in the final third lacking. The play only improved in the second half, but question is how would have the team played if Granada were with 11 players? My view is that the teem needs to improve and improve a lot, the defense needs to be tighter and more focused, the ball movement needs to be faster and there needs to be more combinations and fast wing plays to stretch the opponents. The team also needs to put more pressure on the opposing team when the ball is in their foot. Granada CF (1): Roberto, Nyom, Brahimi, Mainz, Siqueira, Íñigo López, Dani Benítez (Angulo, min. 46), Mikel Rico, Torje (Yebda, min. 62), Iriney (Jaime Romero, min. 83)e Ighalo. 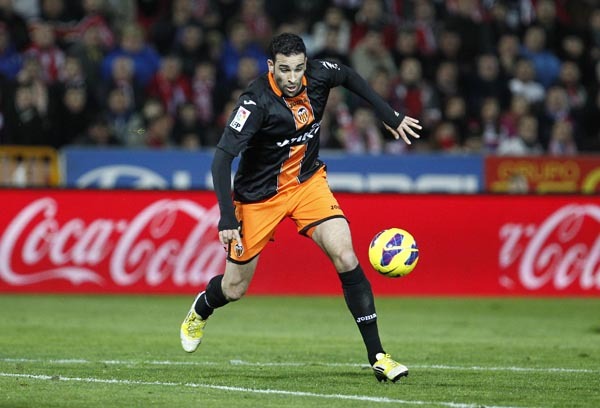 Valencia CF (2): Diego Alves, Rami, Albelda (Valdez , min. 51), Jonas (Barragán, min. 91), Soldado, Ever, Piatti (Tino Costa, min. 83), Pereira, Guardado, Ricardo Costa y Dani Parejo. Goals: 1-0 Min. 49' Angulo 1-1 Min. 59' Jonas 1-2 Min. 81' Piatti. Diego 5 - Was way forward for Granada's goal. Angulo's shot was very good, a powerful lob, but Diego should have been closer to the line and it wouldn't have been a goal. 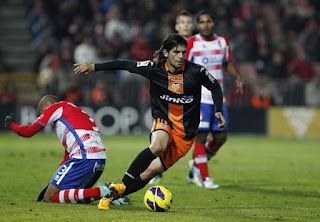 Joao Pereira 6 - Combined well with Piatti, though he did have some trouble dealing with Granada's attackers on occasions. Rami 6 - Didn't have much to do and not at fault for the goal. R. Costa 6 - Again nothing to do as Granada barely threatened and wasn't responsible for the goal. Guardado 6 - Not troubled at all at the back and went forward to great extent, but didn't have anyone to combine with at the left wing. Albelda 5.5 - Did well to cover for the defense at occasions, but was useless in attacking sense and substituted early in the second half to make way for Valdez. Ever 6 - Was involved in most of the actions and was always available for a pass, providing some good passes, but his job was made easier with Granada being down 10 men. Piatti 9 (MotM) - Absolute beast against Granada, caused them trouble all match long, provided countless great crosses, was able to pass his markers numerous times and provided the assist to the first goal and scored the second to mark a perfect afternoon for him. Hopefully his form continues. Parejo 6.5 - Was actually quite useful and dangerous. He provided a lot of useful passes and combined well in the final third, also adding another body in the penalty area when needed. I suspected that his poor play was due to his deep position in midfield and judging on this performance I was right, he needs to play in advanced positions. Jonas 7.5 - Played in a more advanced position and had more freedom in his movement playing off with some good plays by him. He did waster 2 chances with some terrible shots, but accounted for it by scoring a goal. Soldado 6.5 - Scored an assist to his name and missed a good chance when he hit the post. He could have even passed the ball and it would have been a certain goal. Was overall active and threatening. Valdez 6 - Had a chance on goal and was very active on the field, increasing Valencia's energy and work rate significantly.